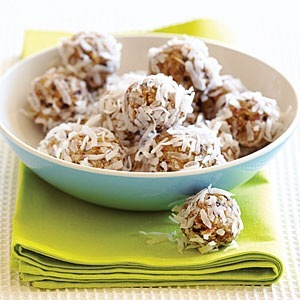 One of my family’s new favorite recipes are these delicious energy ball recipe we got from our in-laws. They are healthy, tasty, and even vegan! I hope you enjoy as much as we do! Sometimes we substitute some of the ingredients for things we already have in our pantry. I’ve used flax instead of the almond meal, almonds instead of seeds or as well as. Be creative and have fun with it! My husband loves these before his runs. They are like a little fuel to get him through his runs. Chickpeas are slightly irregular round legumes, a bit larger than pea-sized. A plant will grow up to 50 cm high and has small, feathery leaves on it. One seed pod will contain 2-3 peas. Chickpeas grow in a subtropical climate, and there are two types of chickpeas: the desi which is small dark seeds with rough coating and the Kabuli which is beige-colored and has larger seeds. Mature chickpeas can be eaten in salads, added to stews or ground into gram flour. It can be used in making hummus or falafel. How to select: Available canned, dried and in some areas fresh. How to prepare: Salads, soups, stews. I also learned that they are very good for you. They are high in fibre, protein, iron, and manganese (an energy booster). Since they are high in protein they make you feel fuller longer so you are less likely to eat large portions. This is always important when trying to watch your weight. One of the biggest things my husband and I learned when we tried weight watchers for a short time is portion control is the key to success. Finding something that can fill you up without having to eat a lot of it is very nice. 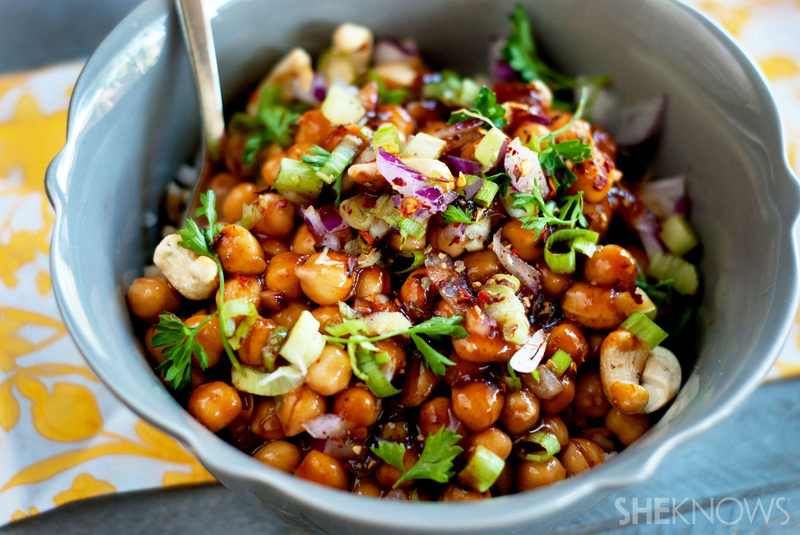 There are so many different ways to use chickpeas, get creative. Pinterest is a fabulous place to find lots of new and interesting ways to use chickpeas in all kinds of ways. Try adding chickpeas to your dinner or dessert tonight! I’d love to hear of any of your favorite recipes with chickpeas below. I think it is important to share my experience to help other mothers out there know they are not alone. It is so easy as a mother to feel guilty for not doing something so many people are saying is the only way to do something. Guilt is a huge hurtle in my journey of being a mother. I constantly have to remind myself that I am a wonderful mother, who loves her children so much, and am doing the best that I can. There is this constant battle inside asking myself if I have done everything I can or are am I doing what is best for my child. When it came to the topic of breast feeding at all of my craft nights during seminary days, I always cringed and thought it was so yucky. I was the one who said I would never try it and didn’t understand why moms made such a big deal about it. Then when I got pregnant I started to think more and more about it. Two things I remembered from all my girlfriends at seminary, one you loose weight a lot faster because it burns so many calories, and second it is healthier for the baby. I initially thought I would at least give it a go. I have always been a pretty easy going person so I figured I could give it a shot and if it didn’t work at least I tried. Then we found out we were having twins! Breastfeeding one baby is one thing but two is a whole different story, I thought. I decided I would try it out anyways. I know a woman at church that had twins and breastfed them so I knew it was possible. She had encouraged me to try. I bought all the tools necessary, even the “breast friend pillow” for twins, and figured I would give it a go. I even went to a breast feeding class that Kaiser (our insurance) offered. Then came the boys, and everything went out the window. You can plan all you want, and I didn’t even plan that much, but when things actually happen its so different. I had a c-section and so my milk didn’t come in right away. I also didn’t get to see Emerson right after he was born due to some breathing issues so he had to be given formula in the meantime. Also, because I was given medicine to slow labor, the boys had high blood sugar and the doctors wanted to give them formula to help regulate their blood sugar. All that to say, things didn’t go as planned. I wanted to keep trying once I got home and would try every once and a while but we were having to supplement with formula to give them enough. I started pumping to try to increase my milk supply but it wasn’t working very well. 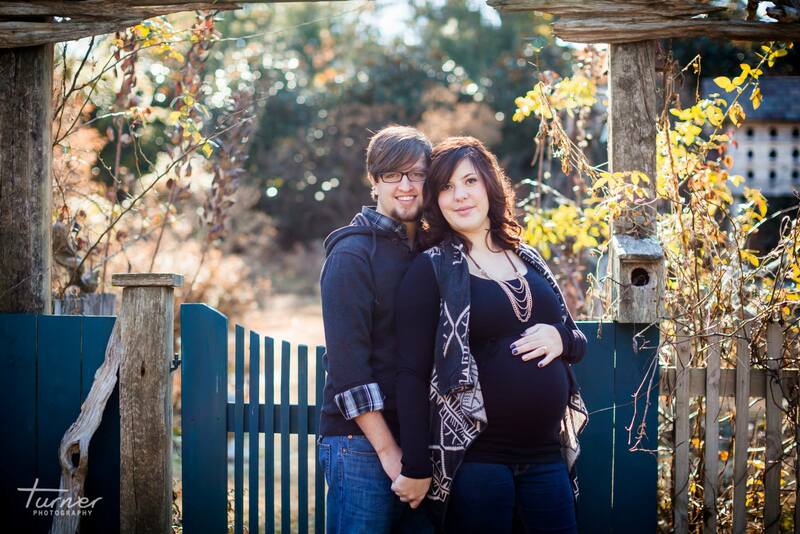 Daniel (my husband) was very encouraging and tried to help any way he could but I was getting really frustrated. We ended going to see the lactation consultant at Kaiser to see what we could do to help. After that appointment both Daniel and I decided that it wasn’t going to work and should just decide to stop. The amount of pumping and feeding I would have to do to keep my supply up for both boys was insane and I did not want to be the only one feeding them nearly 20 hours of the day. The friend with twins from church had told me she had dreams of being in a cow pasture and I was starting understand why. All I would be doing is feeding the babies. Deciding to stop breastfeeding was such a relief. Before I officially made the decision I kept wrestling with myself, asking myself why I couldn’t do it, blaming myself and feeling like a failure. I know moms who have done it and so many say its so important for your child’s health and development. I felt like if I didn’t breastfeed my kids wouldn’t be healthy and it would be all my fault. I really struggled with an overwhelming sense of guilt and failure. I would keep trying to pump and half heartedly attempt to breastfeed but it would just get more and more frustrating. Once I decided to stop, I also decided to come to terms with the fact that it just wasn’t going to work for me. Apart from having two babies to feed and keep up a supply for, breastfeeding is just plain hard. I commend all the moms that do it for any length of time. It isn’t easy and it takes a lot of perseverance. I had to come to terms with the idea that not breastfeeding my babies didn’t make me any less of a mother or bad mother. Not breastfeeding my babies was the best decision for my family and our current life situation. I am not closed off to breast feeding our next child. I want to try again with that baby. I do believe breast feeding has lots of benefits for both baby and mommy. I was lucky to have no problems loosing my baby weight and people even assume I must be breast feeding since the weight came off so fast. I am also lucky to have two very healthy and happy baby boys. People also assume they are breastfed because they are so chunky and healthy looking. 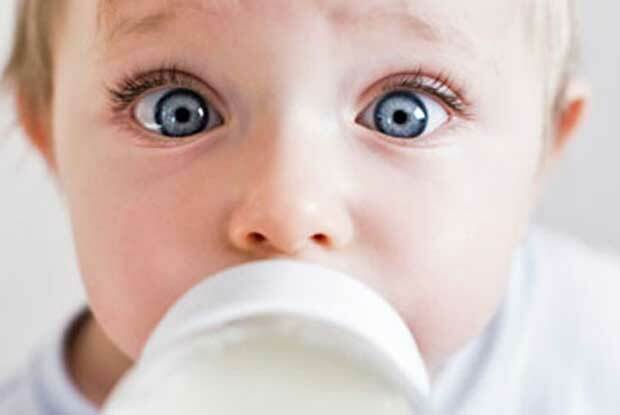 Baby formula has come so far from what it used to be. They have made it so similar to breast milk that it really isn’t that much different. I want all the other moms out there dealing with the struggles of breastfeeding to know that it doesn’t matter what other moms out there say, you need to make the best decision for your child/children, yourself, and your spouse. You aren’t going to be a bad mother if you just couldn’t handle breastfeeding. It is really hard and sometimes it just isn’t your best option. You have other options, just try to make the best decision for you and your family. Do your research and figure out what will work for your child, your budget, and you. Once you come to terms with your decision and truly feel that you made the best and most informed decision you could, it won’t matter what other moms or people say to you. They aren’t in your shoes and they don’t know what you have been through. After having twins I have realized people like to share their opinions with you even when you don’t want to hear it. I have had to learn when to just nod and move on. My brother’s girlfriend, Melinda, gave Daniel and I this cookbook for Christmas this past year and we love it! She knew we were into cooking vegan/vegetarian and that I was an artist, so it was a terrific gift. This cookbook manages to blend food and art in a very interesting way. 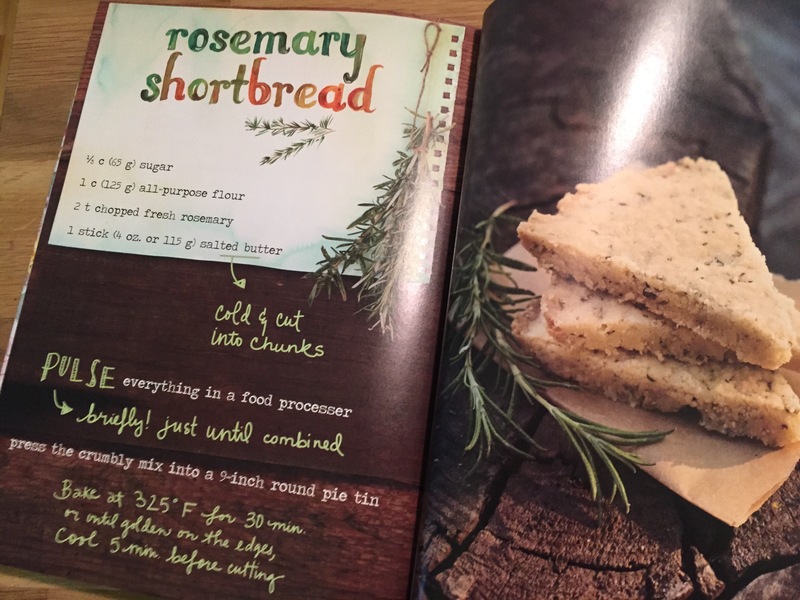 The author uses watercolor painting/lettering throughout to decorate the pages to some simple but delicious recipes. 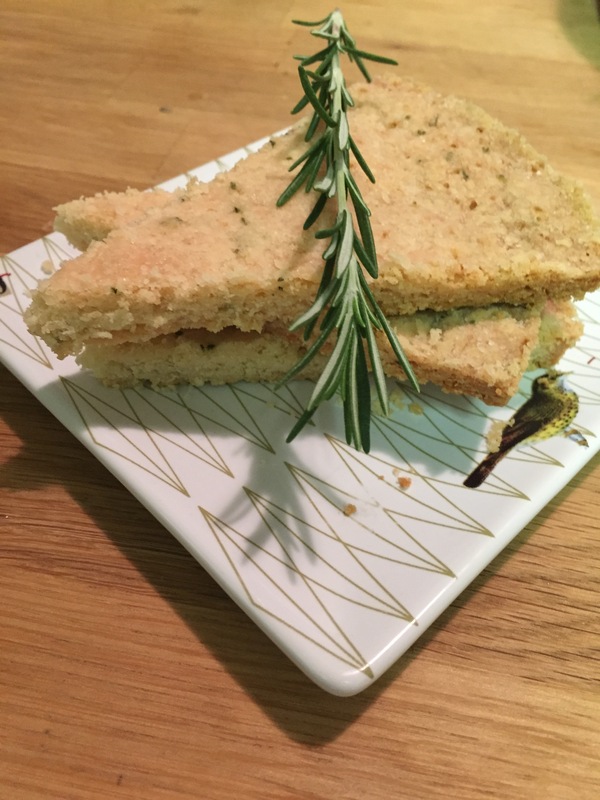 The first recipe we tried was the rosemary shortbread. It was scrumptious to say the least. Daniel was weary of the idea but once he tried it he loved it. Cut cold butter into chunks. Pulse everything in the food processor briefly. Just until combined. Press the crumbly mixture into a round 9-inch pie pan. Bake at 325•F for 30 minutes or until golden on the edges. Cool for 5 minutes before cutting. Another favorite to try is the Butternut Caprese, my mom made it for us when she was here helping with the babies and it was delicious! 1. Bobby Newborn Lounger – This one is not the nursing pillow but the one with the seat in the middle. I received a gift card for Amazon from a family member and had seen these online. I knew feeding times would be a challenge with two and thought this was an affordable option. They have been the most used item we have by far. The boys spend about 75% of the day in them. They are great to have in the living room so they can nap while we are hanging out and we can feed them in them too. You can find them here at Amazon. 2. Cloud B Tranquil Turtle – This was a gift from one of my fabulous co-workers. We used it in the bassinet when the boys first came home. It lit up the room enough for us to see them, making the ceiling look like moving water. There is a tranquil sound maker on it as well that you could adjust the volume on. I think it helped mommy and daddy sleep too! There are a few different color and animal options. You can also get this one on Amazon here. 3. 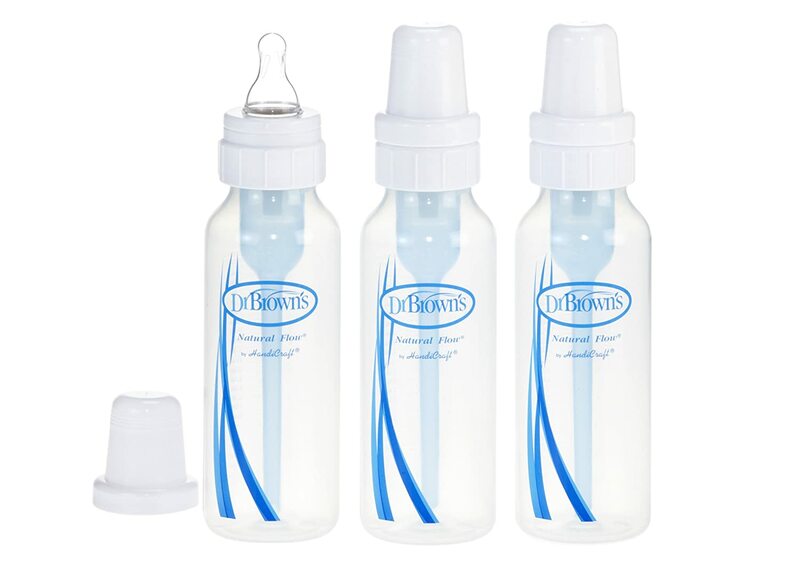 Dr. Brown Bottles – These are my favorite brand of bottles. A friend gave us our first set of the 4 oz. bottles, which was such a blessing. They are a bit more pricey but worth the money. The boys have started drinking 5-6 oz. so we just ordered the larger size (8 oz.) because we love them so much. They have the natural flow feature to help with colic and fussy feeders. We bought ours on Amazon as they have the best prices and great shipping. 4. 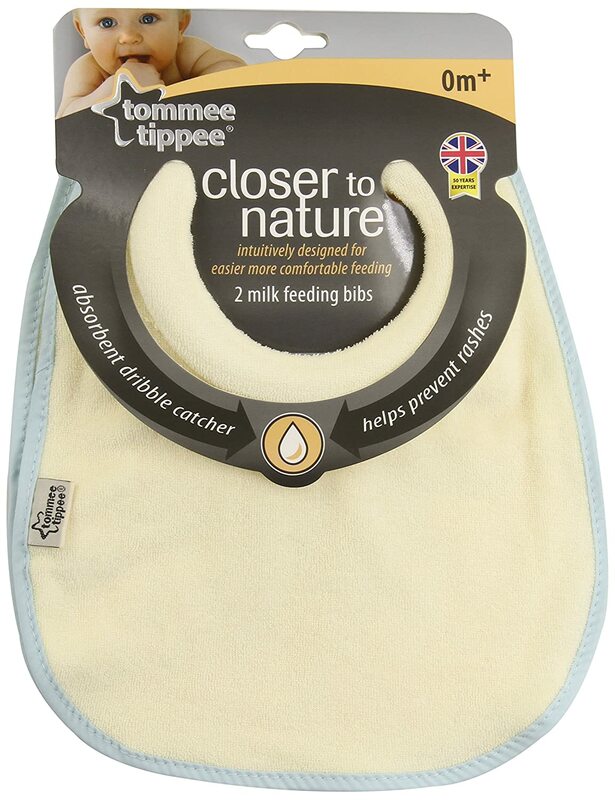 Tommee Tippee Feeding Bib – Our boys are messy eaters. I like that these bibs have a rim around the top that sits closer under their chins to catch the milk when they spit up or the milk runs down their chin. They are also a great size and wash really easy. We purchased ours at Babies-R-Us but here is the link to them on Amazon. 5. 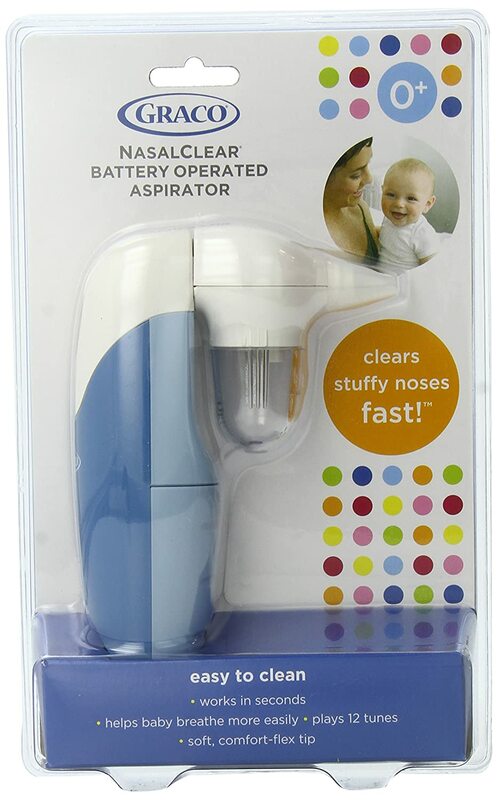 Graco Nasal Aspirator – The boys got a little cold at one month and really hated the plastic bulb we received at the hospital. I did some searching and found this one online. It is battery operated and very gentle on their little noses. The front half pops off and is really easy to clean without getting the whole thing wet. There is a music feature on it but we don’t really use it. We also ordered this one on Amazon. 6. 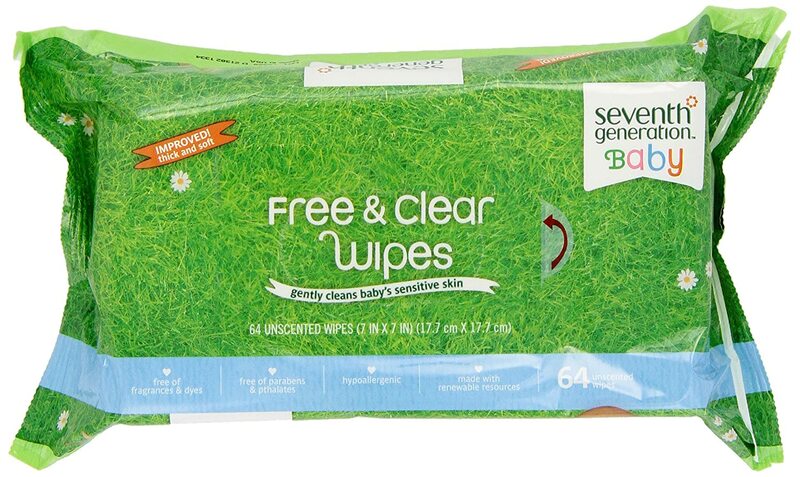 Seventh Generation Baby Wipes – Daniel’s cousin sent us a box of these wipes as a baby gift because she loved using them for her children. We got hooked. These are great for the boys. They are a good quality and do the job well. The boys have had a few problems with Huggies wipes giving them sores so I love that these ones are free of all the bad stuff, so we don’t have to worry. Amazon offers a subscription with these since you will definitely go through lots of these. 7. 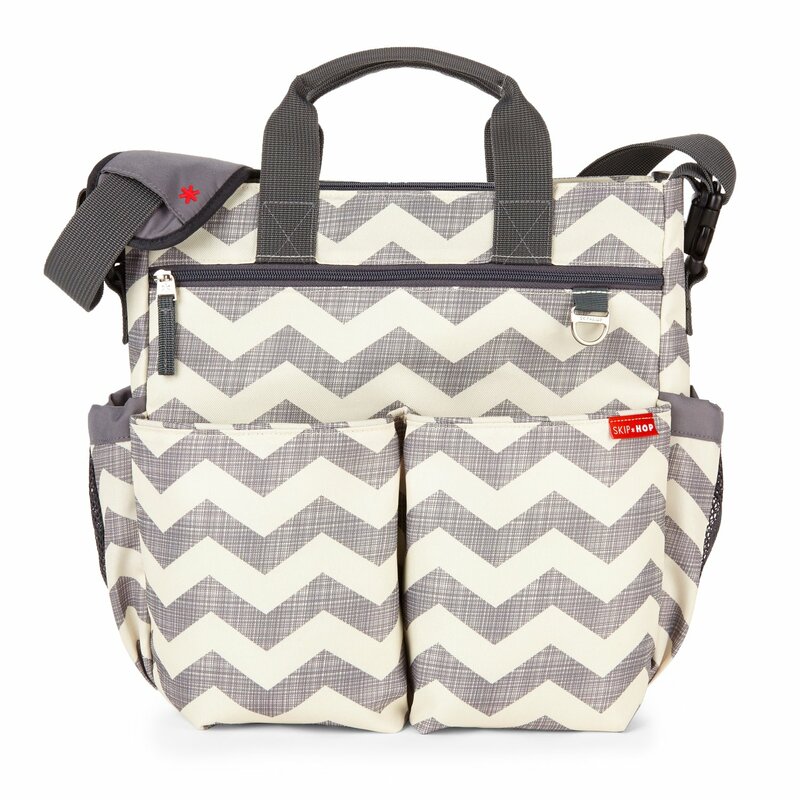 Skip Hop Duo Diaper Bag – I love the design of this baby bag and it is very functional as well. It comes in lots of different colors but I love the chevron print to keep it pretty gender neutral for future use. It also fits over the handle of the stroller really easy so it is easier to transport. I purchased this at Babies-R-Us with some of the gift cards from the shower but check it out on Amazon to see all the different color options and a great price. 8. 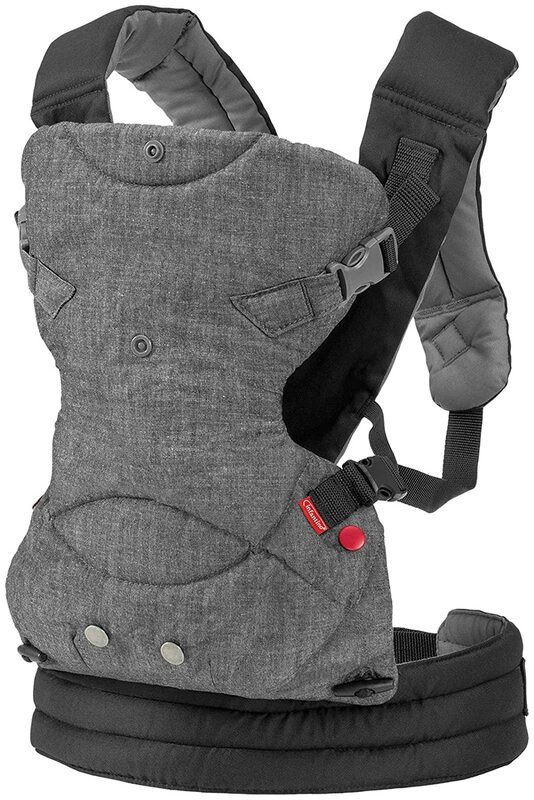 Fusion Flexible Position Baby Carrier – We received two of these as gifts at a baby shower from our registry and we love them. They are really easy to put on and get the babies in. We decided to wear the boys to church for the first few weeks so they weren’t getting passed around and they worked out great. We have the Moby wraps as well but I like that it is easier to get the boys in and out of these carriers. They are also more affordable than most of the other carriers. I am not sure how long the boys will fit in these but for now they work great. Check them out here. Note: As you can see I included all the links to the items on Amazon. We have a Prime account with Amazon, which I highly recommend. Having two boys at home makes heading to the store a little more challenging when we need something. Prime has two-day shipping so we order and get the item with in a few days. We love it! They also have a great subscription feature now where you can receive a discount for subscribing to certain items. Everyone has a different story about their pregnancy experience, so why do we only ever hear the cliché things? Morning sickness, natural over epidurals, sleepless nights, major mood swings, etc. The clichés get even worse when people hear you are having twins. 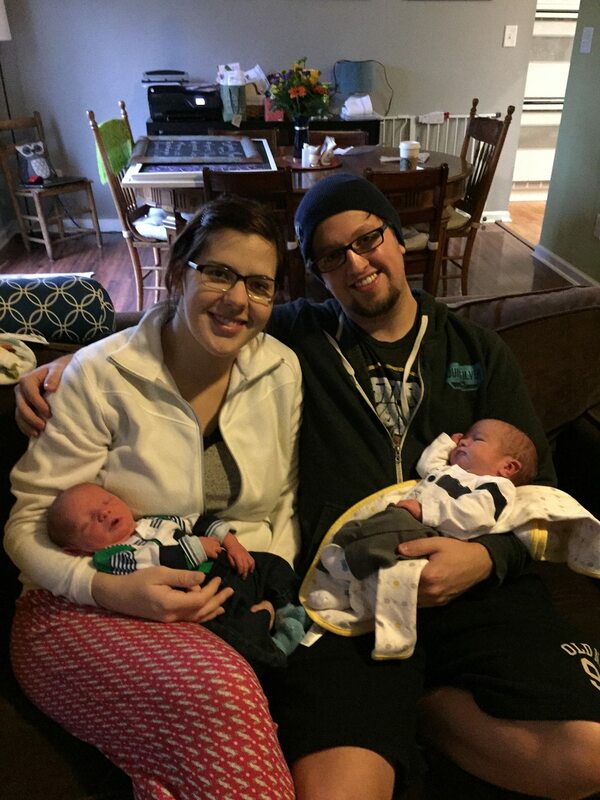 I thought I would write out my story to share how having twins wasn’t such a terrible experience. Almost everything I read during my pregnancy about having twins was horror stories. A lot of those things are true but they don’t define a pregnancy, they just happen to be a few side effects of bringing a beautiful bundle of joy into the world (or two bundles of joy). The first thing people asked me when I said I was having twins was, “did you get pregnant naturally or through fertitly?”, it wasn’t always said that bluntly but yes, people actually asked that. The first thing I learned was that people really say/ask the craziest things when you are pregnant, and they also love to tell you all the horrible things about being pregnant or being a parent. We also got a lot of “you are going to have your hands full” and “you better get your rest now”. 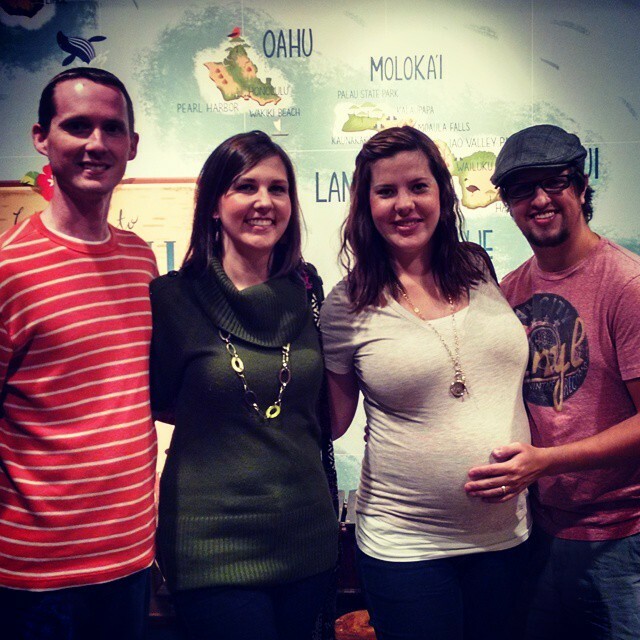 At the beginning of June, after returning from a work trip, I had a suspicion that I was pregnant. I didn’t want to get Daniel’s hopes up if the test came back negative so I picked up a test and took it without telling Daniel. Early on June 4th I woke Daniel up by whispering “I am pregnant in his ear”. He didn’t believe me at first and kept saying he wouldn’t believe it until a person in a white coat told him. It finally settled it that it was real and we were both so excited! We had been trying for a while and were very happy to hear the news. Things got dramatic early on…I got hit hard with the pregnancy “morning sickness”, which is more like all day sickness. Daniel & I had booked a cruise in February for the end of June, not exactly the best timing. We got to the port and I made the mistake of being a little too honest and forthcoming with the fact that I was pregnant. I hadn’t had my first appointment yet because I was only 6 weeks pregnant so I didn’t have a form from my doctor. The boat doctor informed me that they didn’t want to risk having me on the boat without doctor consent in case I had a miscarriage. We were very upset and frantic. Long story short, a doctor at our doctor’s office went out on a limb for us and emailed a consent form saying I was able to travel. We got lucky; he hadn’t ever met me and didn’t have to email anything. The boat wasn’t too bad on the morning sickness surprisingly but I was very tired and had to take things a little more easily. We also didn’t know at that point that we were having twins, which later explained why I was so sick. Both of my grandmothers and one of Daniel’s grandmothers are twins so we had joked many times about how our chances of having twins were really high. We got asked that a lot too, “do twins run in your family?”. The day of our first doctor’s appointment I had been joking with Daniel’s sister how we were going to find out we were having twins. When the doctor did the ultrasound and actually informed us we were having twins I started laughing and thought he was joking. Daniel was so excited, as was I, it just took me a second to take it all in. All of our family and friends were super excited for us too. Definitely a shock for both our parents. Neither of them had any grandchildren and they were then informed they were getting two at once. My morning sickness was not very fun. It lasted about 4 months and made it difficult for me to work and to gain weight. In the first 4 months of my pregnancy I only gained 4 pounds. The doctors were not super happy with that so I had to go visit a nutritionist. I can honestly say I had never hated food so much after that. The nutrionist put me on a 3000 calorie diet and the first few meals did not stay down at all. Who on earth is able to eat 12 servings (1 cup = 1 serving) of protein. I was somewhat vegan before the pregnancy so this was not fun at all. Even though the morning sickness was really rough, I decided pretty early on, and I think it is just my easy going personality, to have a good attitude about it all. I feel like it is all what you make it. I had some melt downs, I won’t lie, but I really tried to stay positive. After the morning sickness passed, everything was going smoothly. I started gaining weight at a normal rate and all my doctor visits showed our two baby boys growing at a great rate. My baby belly was growing so fast. It was fun to keep track and watch it grow. At the end of the pregnancy I made a video to show the progression of my belly. It was super fun to look back. On the morning of January 24th I had some familiar contractions, they were light and not very painful, but I had lost my mucus plug (sorry TMI) so I thought I should call the nurse line just to be safe. I talk to the nurse and she then talked to the doctor on call and suggested we head to the hospital to be safe. We packed up our stuff in the mini-van and headed to Piedmont Atlanta. I wasn’t in much discomfort and we assumed they would be sending us home as soon as we got there. They hooked me up to the monitor to track contractions. When I called in from home I thought my contractions were 7 minutes apart for about 1 minute. When the monitored them they were at 2 minutes apart for 1 minute. They then did an ultra-sound and found out that both babies were transverse (breech) and that there would be no possible way to have them vaginally. We knew that at least one of the boys was breech and had been prepared to have a C-section if doctors decided it was the best option. I had decided early on that I would keep an open mind and easy going attitude as far as my “birth plan”. 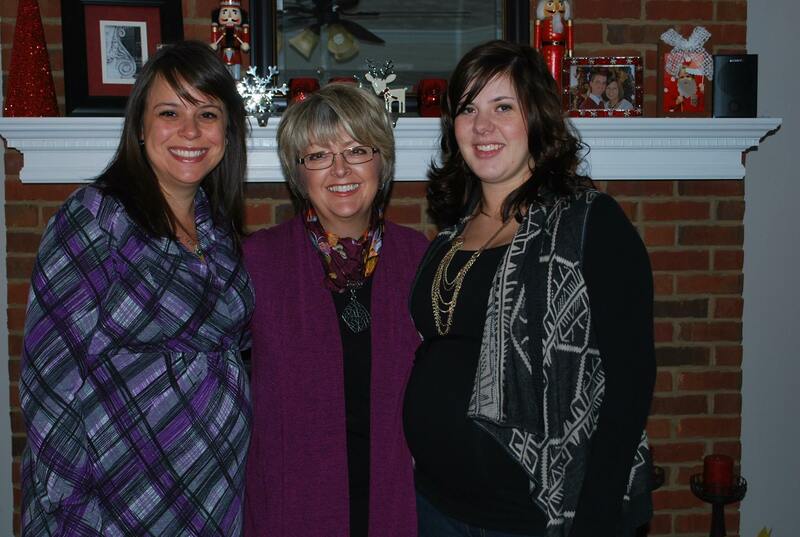 We had done the birthing class just in case and to be well informed, so we were prepared for anything that came our way. I believe my easy going attitude made things go so much smoother than they could have. Things went fast once they assessed the situation. We arrived at the hospital at 9am and I was in the operation room by 10:30am getting my epidural. (The epidural really is no fun by the way… Daniel couldn’t be in the room and I was so nervous I was shaking like a dog. The pain wasn’t that bad, it was the nerves that got me. 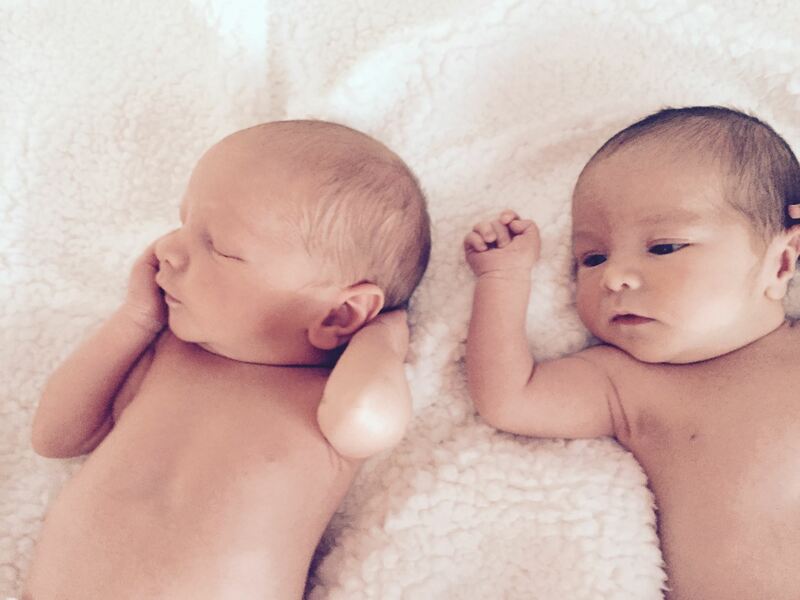 I am not really a fan of needles…) The boys were born 2 minutes apart at 11:11am and 11:13am. 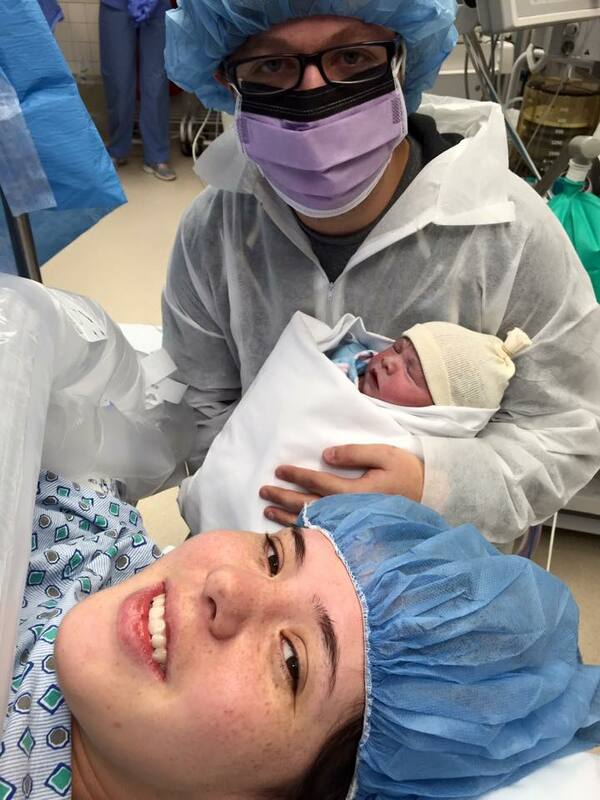 The C-section went pretty well. I did have some issues when they started stitching me up so they ended up having to give me general anesthesia. Emerson had some problems with his breathing that the nurses needed to keep an eye on so he wasn’t able to come to our room till about 5 hours later. That may have been the hardest part of the whole thing. I wasn’t really able to see him after he was born until about 5pm. Daniel saw him while I was finishing up in the operation room and the rest of the family saw him through the window while he was in the nursery getting attended to. It helped to have Logan in the room though. I was in love! People always say how amazing it is, that there is nothing like it, and they were telling the truth. Your heart just grows and being blessed with two boys was almost too much to take! They instantly had Daniel wrapped around their finger. He had to do most of the diaper changes since I couldn’t get out of bed for the first few days (he was amazing and I couldn’t have done it without him!). 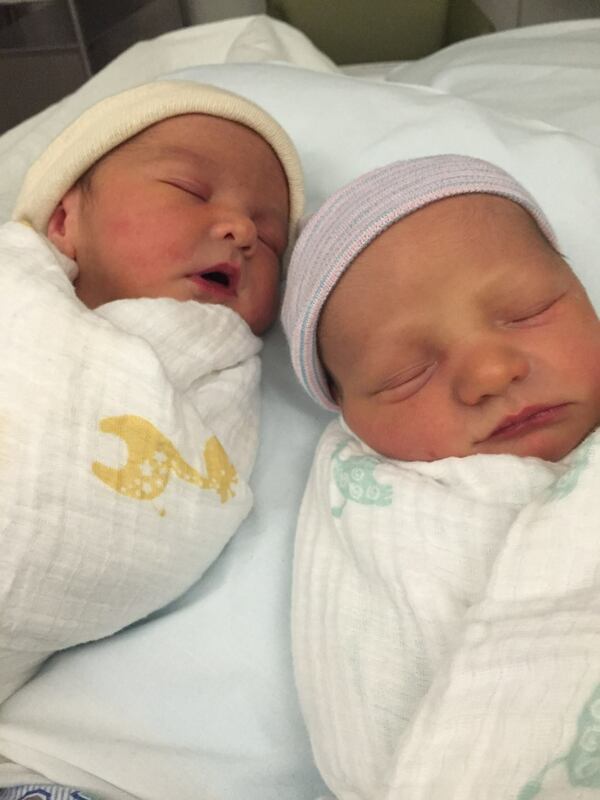 Both boys ended up being very healthy and all the nurses couldn’t get over how big they were for twins. 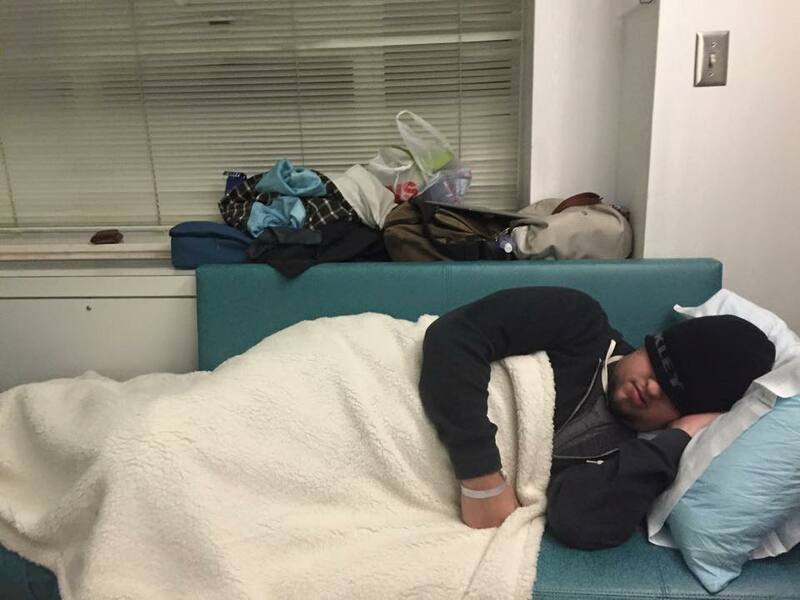 We stayed in the hospital for 5 days. I had a few problems with my blood pressure so the doctor wanted to keep me an extra day. We had lots of family and some of our friends visit us in the hospital. We were very anxious to be headed home. Daniel especially, since he had to sleep on a very uncomfortable bed/couch (they really should create something a little more comfortable for dads). Daniel’s parents and grandparents greeted us at our home. We adjusted to home life pretty easy. I was able to get about 3 months off work, such a blessing, and Daniel works from home. I wouldn’t be able to do it without him at home. The boys are almost 6 weeks now and have grown so much! Logan is just over 10 pounds now and Emerson is about half a pound behind him. They are 21.5 inches long and wearing size 0-3 months now. They definitely grow so fast! At home with the boys! Sleep when they sleep– time of day is not important when the wake up every 3 hours sunshine or no sunshine. Wake both boys up at the same time– it never pays off to let one sleep a little longer, you will be up all night. Do what is best for both your sanity and the kid’s wellbeing– I had to let go of the desire to breastfeed or I was going to lose my mind. I felt like a failure at first but then realized I had two boys to feed and mothers with only one child have a hard time. I tried and it didn’t work for me, at least I gave it an effort. Take help from family and friends when they offer and don’t feel bad.The boys had a sleep over at the grandparents two weeks after they were born and it was such a blessing for Daniel and me. The boys enjoyed some bonding time with their grandparents and Daniel & I were able to get a full night’s sleep. It’s okay to feel overwhelmed every once and a while, parenting is not easy– you are not perfect and things are going to get to you. Having people around for support is super important and helps you know you are doing a great job! There are lots of other things we learned but those are a few of the big ones I learned. This is definitely the longest blog I have ever written and it doesn’t even tell it all but I hope this was at least a little glimpse into what it was like to carry these two beautiful boys for 37 weeks. There were a few rough moments along the way but that all faded away the second I held these boys. I can’t wait for all the new things being a parent has in store for me. I am sure things will only get harder but it is such a blessing God has given us. I only pray that we don’t mess it up! Make sure you keep coming back as I share about our journey raising these twin boys. Apart from being an awesome show with tons of talent and wonderful judges, I love how The Voice brings unknown songs to light. Cole Vosbury performed Let Her Go by Passengers in the knockout rounds and I fell in love with both him (musically) and the song. I had never heard of the song or the artist before. I think it is so cool how not only is the show supporting new artist trying to make it in the music industry but it is also educating the world on all the different genres and artists that are out there. I find myself hearing songs while out and about and not knowing who the artist is but who performed it on The Voice. There are many other songs on the show that I haven’t known and loved, but this is one of my favorite. I thought I would share it with you. Listen below and let me know your thoughts or share one of your favorite songs.